‘Career counselling, Aptitude testing’ such words never existed in our world back in year 1984 when I finished with my HSC. Todays’ generation is lucky in a way that they get a chance to explore and identify their strengths, get guidance as to which career can suit their overall personality, interest and aptitude. In those days this was not the case. I missed my admissions for medical just by few marks and then there was a question mark about what to do next. I was not familiar with the words interest or aptitude, but only thing I knew was I loved children, I could get along with them very well and I wanted to work in a field related to children. So when somebody gave me information that there is a stream called ‘Physiotherapy” in which specialization in pediatrics can be done, I just jumped in. Looking back, I feel very happy that I took a right decision. After all, which is the right career for you? My answer to that question would be – where your body, mind and soul get aligned, your work gives you inner happiness – that is the right path for you. I was fortunate that the decision I took unknowingly turned out to be perfect for me. I had most of the abilities such as patience, creativity, communication skills, empathy, physical and mental strength which a pediatric physiotherapist needs and so I was successful. Most importantly, I was happy. I work with children with special needs which gives me immense pleasure. It’s not only me doing therapy for them, but in return, these children and their parents teach me lessons of life. This world of special children is very different, not known to many people unless one has a special child in close acquaintance. There are many such problems in children due to which their normal childhood development and unfolding of various age appropriate skills does not take place. These children do not attain normal developmental mile stones. Single or multiple areas of development such as physical skills development, intellectual development, speech and language development, emotional development, social skills development can be hampered and intensity of the problem varies from mild to severe. Depending upon the type of problem, these children require single or multiple therapies. As a physiotherapist my expertise is in the area of physical skills development, especially gross motor skill development. Any problem involving big joints and muscles of our body which makes it difficult for a child to have stable posture and attain mobility is the main area of work of a pediatric physiotherapist. Immediately after my graduation, I got married and moved to Middle East countries in 1988. I got a chance to work in the hospitals in Saudi Arabia and Kuwait till 2008. Then we decided to return back to India. 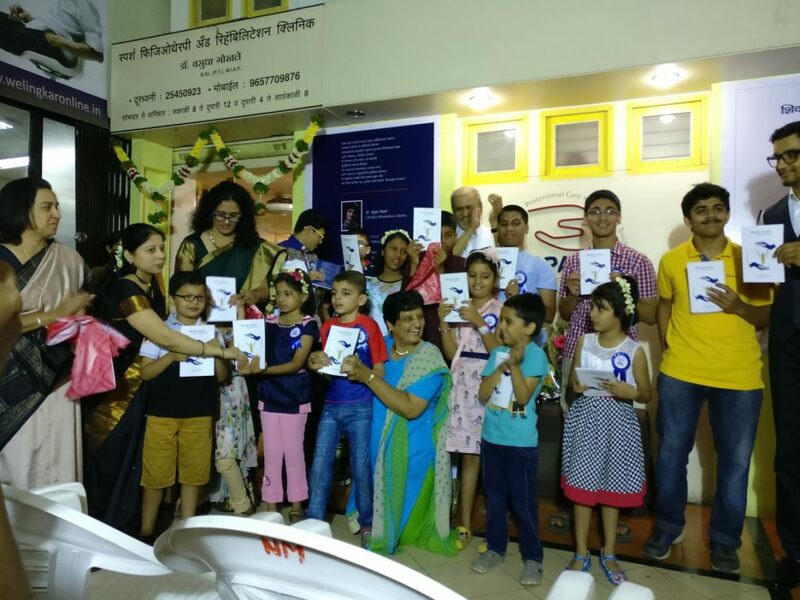 My dream of having my own clinic set up where all types of therapies required by special need children will be provided under one roof came true after our return to Pune. Our SPARSH clinic became functional from March 2009 and went on flourishing. I was very fortunate to get likeminded, sincere and experienced team members who literally live our clinic’s motto i.e. ‘Professional care with personal touch’. If the child has special needs, the challenge of parenting intensifies remarkably. This has an influence on the personal, family, professional and social lives of parents. Depending on the respective family’s, educational, social and financial backgrounds there can be different perspectives of looking at these problems. In fact, even the parents’ mental-emotional strength needs to be enhanced. Parents do need help and counseling to a degree, which is equal to, or in fact even more than that of the therapy required for the child itself. I was trying to help both, parents and children intuitively, but I felt the need of acquiring some more skills. So at one point of time I decided to take formal education for that. I did one year full time post graduate course in counselling and started my second journey at the age of 45. As of now, I have taken counselling as my full time career. I work mainly in the field of special need children, taking individual as well as group sessions for children and parents. Based on my experience in this field, I also wrote a book in Marathi for parents of special children. My journey started as pediatric physiotherapist and took a turn as counselling psychologist. But both the fields have given me meaning of life, purpose of life. It’s a beautiful thing when a career and passion come together. At the end only thing I want to say is, ‘Do the work that feeds your soul and not your ego’. I am running a series on alternative careers, inspiring stories and busting myths about traditional career. If you follow an alternative career or know someone who does, please do fill this form and I will get in touch with you super soon. Wonderful wonderful. This profession is still a not so chosen yet for the mindset. You sure are creating an awareness Neha. Aaaammmaaazzziiinnngggg! Thanks Akshata! True, we truly need to first understand the many options that are available out there! A wonderful series bringing about a change in the mindset. so good to know more about not the famous careers! Vasudha’s sincerity and he love towards her chosen field reflects in thought process. Thanks Neha for letting us know such people and teaching us about different career options through this series..
That’s an inspiring journey for all of .Special needs children are special and need dedicated help.Glad that something like Sparsh exists. Thanks Amrita! Vasudha is a powerhouse and has immense love for the work she does. Love the idea of this series. With each post, I am keen to read the next one. Amazing work, keep it up. Such an informative post Neha. I am in love with this series and keep up this good work. Inspirational! Really nice and inspiring write up! Loved it! Congratulations and God bless Vasudha for the wonderful job that she is doing .. This is one profession where demand is more than the actual people out there ! I never knew any of the professions back during graduation .. I am so glad u came up with these posts! Wow!! I didn’t know so much about you, Neha. You have chosen such an amazing profession. And thanks for writing this article and sharing your story . It surely creates awareness about the many career options. 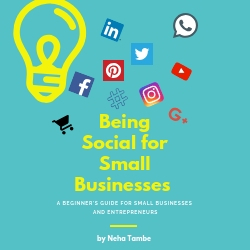 Neha, I am loving the series you are doing on alternative careers. I want to bow down to Vasudha Gokhale for doing such an amazing job for special need kids as well as for their parents. God bless. It’s really great to know about the careers that are not the talk of the town! A special child’s condition can be understood only by the one who actually has one. These are strong lines that are not realised by everyone. This is a truly heartfelt post. Some lines are close to heart- feed your passion and not ego. I can connect with your post.. As i went through something of this kind. Love your work. I strongly believe that if you work in your field of passion, it works wonderfully. Vasudha’s story is a true example of this. Thanks for introducing her to us. such an interesting take and how her work has evolved. this is an interesting series where you are bringing forth people and their works and initiatives about which we may have learnt about.. I agree that indeed, we are the lucky generation to be aware of our choices and resources we have to make our dreams come true. 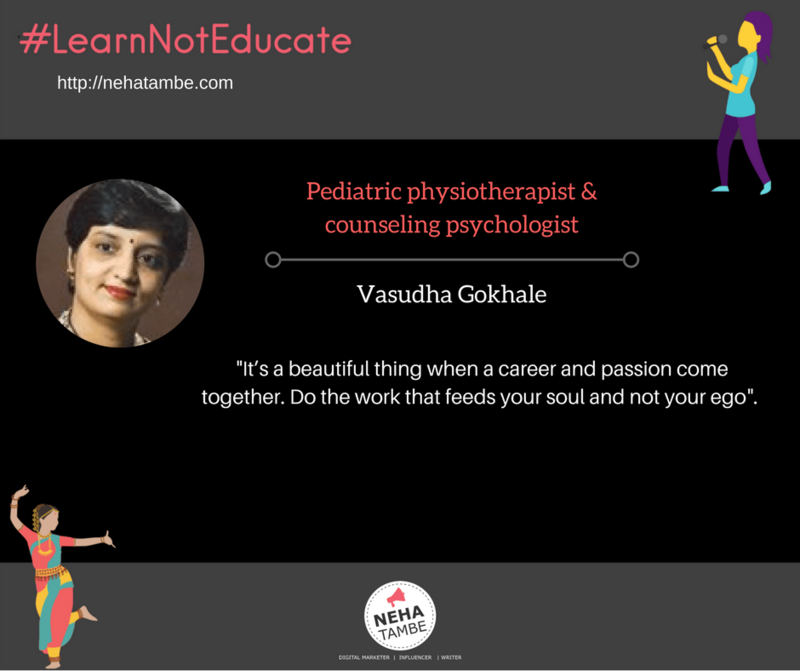 Ladies like Vasudha give us all the inspiration we need to take the step towards making our passion for our work. This is so inspiring. I have been meaning to do a course & become a Life COach. This gives me a right direction for sure. A cousin of mine is a special child. It’s not easy but I think as humans we must understand the depth of them and with empathy and not sympathy work with them and help them achieve great things. Vasudha is an amazing lady who is working for the betterment of the parents. I would definitely get her book and read as well as gift it to my friend who is a new mom. Very informative and inspiring post. Very well written.